Saint Martin Residence condominium is located in one of the most prestigious and well-known area, St Martin's Drive off Orchard Road. This development is a low rise condo with only 82 units and suits the profiles of single professionals. It is only 5 minutes walk to the Botanic Gardens and Tanglin Shopping Centre, Forum Gallery, Tanglin Mall are directed across the road. Looking like a Balinese resort, this place is very quiet and private compared to other developments. The resort looking foliage is designed by renowned landscape architect, Mr Michael White. In the interiors, light coloured platform wooden dining area and light brown marble flooring in the 2 and 3 bedroom units. Top-notched finishes are used for the kitchens and bathrooms The penthouse units have a double volume ceiling, which accentuates the space even more. Residents of the penthouse units can also enjoy sunbathing at the rooftop area, which also comes with a Jacuzzi. Each unit comes with a small balcony that oversees the swimming pool. 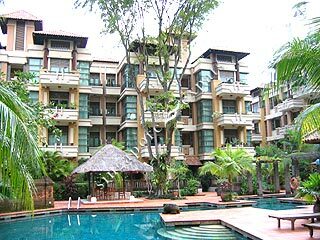 Quiet and Beautiful breezy environment with Balinese Gardens and pools.